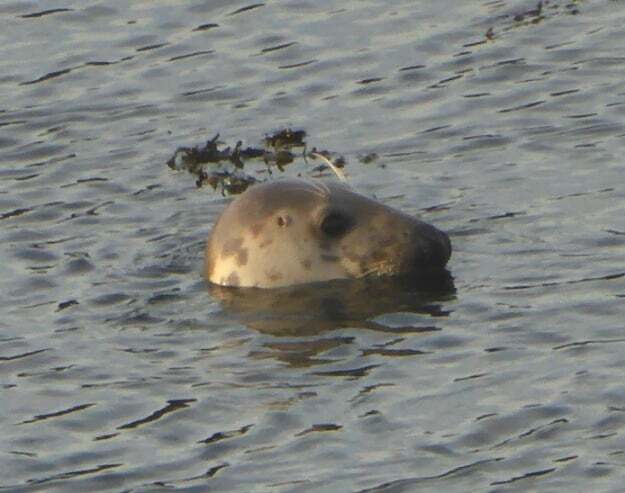 The peninsula that juts out between Oldany Island and Culkein Drumbeg (NC1033) is often a good place to see seals. This was certainly the case on the morning of 5th January, when we walked around it in weak but welcome winter sunshine, over vegetation still crunchy with frost in places. 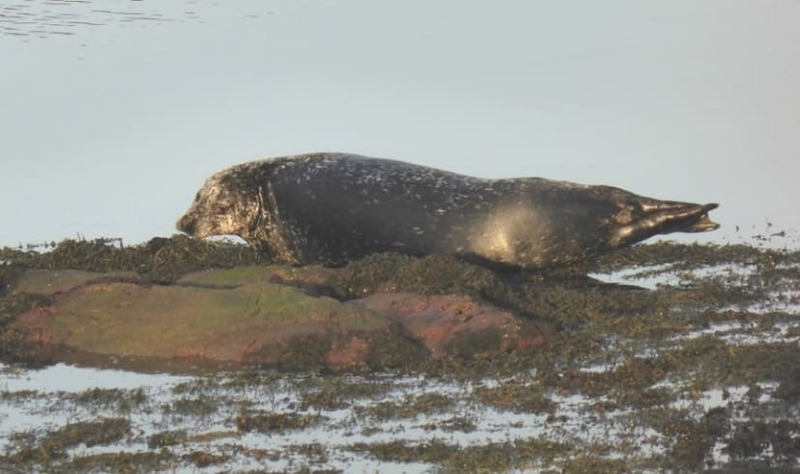 On the western side, at least eight common seals were either resting in their usual ‘banana’ posture on small skerries, or active, overtly curious about our presence, in the shallow waters in between. They have ‘doggy’ faces, with dished profiles, and when seen close up, a distinctive Y-shaped pattern to their nostrils. It is this species which can sometimes be heard ‘singing’ in this area. Amongst them, there was at least one grey seal, rather larger, with a markedly different shape to its head, which is all we saw. It had a straight or slightly convex profile, sometimes described as a ‘Roman nose’, and when it turned its head towards us, we could see that the nostrils, although converging, did not meet. It also appeared to have a more splendid set of whiskers, but they may have just been catching the sun. 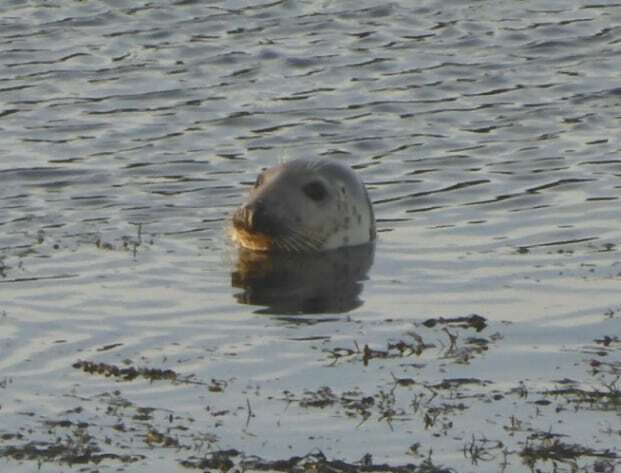 There are usually a few inquisitive heads in the waters on the north side of the peninsula, but none on this occasion. 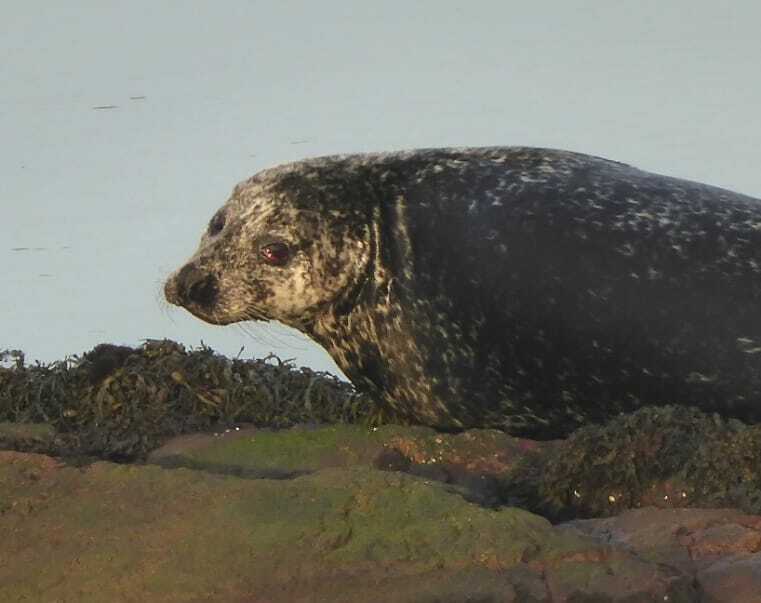 At least ten more common seals were present on and around rocks along the near side of The Dornie, at the mouth of the Oldany River, on the east side. There wasn’t much else about, apart from the usual coastal birds. A distant oystercatcher had us puzzled until we realised that it had its head turned away from us and colourful bill tucked under its wing. More noteworthy, for us, were a great northern diver in winter plumage and a flock of 17 teal, disturbed from a muddy bay on the near side of The Dornie. David and Avril Haines tell us that they see them regularly during the winter on their WeBS counts in this area.